We celebrate our beloved guru Sri Kaleshwar on His Mahasamadhi Day. Sadguru Priya, beloved Sadguru, Sai Kaleshwar. You are the giver of Sathya (the truth), Dharma (right action), Shanti (peace) and Prema (love). Thank you for all your love, Swami Kaleshwar! Om Bolo Sai Nath Sri Swami Kaleshwar Maharajiki – Jay! Dr. Sri Anupati Kaleshwar loved music. He was an Indian master of the ancient knowledge and energy systems and he was considered a saint in his native land and to thousands of students. When the bhajans filled the evening air, it would often inspire him to teach or fall into deep, silent meditation. He was born on January 8th in Kadapa, southern India. His spiritual life began at the age of 14 years with a profound encounter with the legendary saint, Shirdi Sai Baba. Baba is one of India's most revered saints. Baba led the young Kaleshwar to ancient palm leaf books filled with sacred formulas to nature and the divine. Sri Kaleshwar´s mission was to teach the profound spiritual knowledge of ancient India. He taught how to experience the full potential of the soul and bring peace, wisdom and healing in the world. "The only difference between the master and the student is the knowledge," says Swami. His belief is that every person has the potential to do extraordinary things and may reach the level of a Shirdi Baba or Jesus. 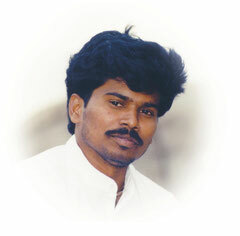 Sri Kaleshwar has put his life at all levels in the service of humanity. In 1993 he founded his ashram in Penukonda where students from all over the world study this sacred knowledge. In 2007 he was honored for his humanitarian service by the Open International University in Malaysia with a doctorate. He is the author of several books, such as "Shirdi Sai Baba", "Kaleshwara Vaastu", "Sai Shakti - 108 healing techniques," and one of his last books, "The true life and teachings of Jesus Christ."